Callopistria apicalis Walker comb. n.
Mosara apicalis Walker, 1855, List specimens lepid. Insects Colln Br. Mus. 5:1032. Plusia inaperta Walker, 1864, J. Linn. Soc. Lond. (Zool) 7:70. Anophia lateralis Walker, 1865, List Specimens lepid. Insects Colln. Br. Mus. 33: 917. Diagnosis. The male antennae are much more strongly bipectinate than in any other Oriental Callopistria. The forewing is a dark, dull brown with obscure markings except for a fine, angular, pale submarginal distal to which is a row of irregularly sized, black, sagittate marks, strongest near the apex. The basal part of the forewing is darker, and the reniform is edged finely paler distally. The hindwings are dull brown with the basal third pale brown or whitish, paler in the female. The male hindwing is distorted by a hollowing of the underside over the dorsal half which is paler and contains scent scales, bounded anteriorly by a ridge of dark scales. 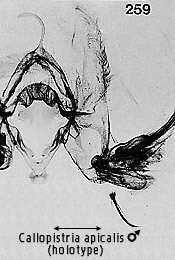 The facies is not typical of the genus but the male genitalia show features such as: loss of harpe; slight swelling of the uncus, with a weak apical hook; fusion of the transtillae into a bridge dorsally to the anellus; elaboration of the sacculus, though into a uniquely multilobed, almost corematous structure, and with independent interior processes that lie along the vinculum towards the saccus. The aedeagus lacks the restriction of sclerotisation shown by most Callopistria, has a small vesica, but a complexity of apical spining. Both the seventh and eighth male abdominal sternites are strongly modified (Figs. 257, 258), but with no clear parallels with other taxa. The female genitalia are not inconsistent with placement in Callopistria but offer no distinctive features. Taxonomic notes. The species typifies the genus Mosara Walker. The hindwing venation is quadrifine as in Callopistria. The features noted above indicate that the species might be a divergent, early branch of Callopistria, hence Mosara is brought into synonymy. Geographical range. Indian Subregion to Sundaland, Philippines. Habitat preference. The ecology is unknown; one specimen is from the 'foot of Mt. Dulit'. Probably it is from forest habitats.